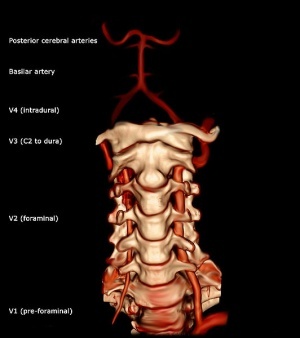 The vertebral artery is a major artery in the neck. It branches from the subclavian artery, where it arises from the posterosuperior portion of the subclavian artery. It ascends though the foramina of the transverse processes of the cervical vertebrae, usually starting at C6 but entering as high as C4. It winds behind the superior articular process of the atlas. It enters the cranium through the foramen magnum where it unites with the opposite vertebral artery to form the basilar artery (at the lower border of the pons). The first division runs posterocranial between the longus colli and the scalenus anterior. The first division is also called the ‘pre-foraminal division’. The second division runs cranial through the foramina in the cervical transverse processes of the cervical vertebrae C2. The second division is also called the foraminal division. groove on the upper surface of the posterior arch of the atlas, and enters the vertebral canal by passing beneath the posterior atlantoöccipital membrane. The fourth part pierces the dura mater and inclines medial to the front of the medulla oblongata. It supplies 20% of blood to the brain (mainly hindbrain) along with the internal carotid artery (80%). It lies close to the vertebral bodies and facet joints where it may be compressed by osteophyte formation or injury to the facet joint. In older individuals, artherosclerotic changes and other vascular risk facotrs (e.g. hypertension, high cholesterol, smoking, diabletes) may contribute to altered blood flow in the arteries. The vertebral and carotid artieries are stressed primarily by rotation, extension and traction, but other movements may also stretch the artery. As little as 20% of rotation and extension have been shown to significantly decrease vertebral artery blood flow. between C1 and entry of the arteries into the skull. The most common mechanism for non-penetrating injury to the vertebral artery is extension with or without side flexion or rotation. ↑ 2.0 2.1 2.2 Magee, D. Orthopaedic Physical Assessment. Elsevier.